What do people actually do for side-hustles? And how much do they make? We ran a survey to find out. Somewhere in Denver, there’s an accountant who runs a thriving cosmetics business on the side. In Minneapolis, there’s an aerospace engineer who sells cat-themed t-shirts out of her garage. Over in Canada, a computer engineer spends his off-hours teaching out-of-shape dads how to lift weights. Meet the side-hustlers — people who’ve set up secondary businesses outside of their day jobs. Who is included in this survey? 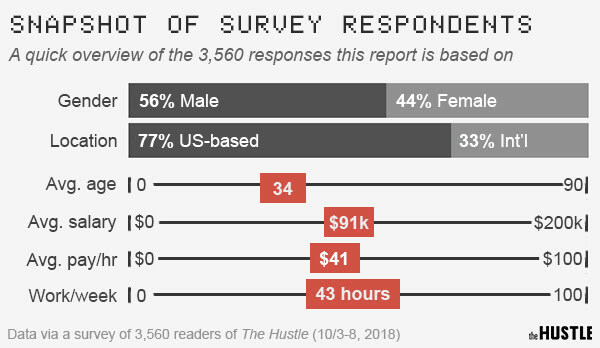 The results in this study are based on 3,560 responses from a survey sent out to The Hustle email list between October 3-8, 2018. Our respondents skewed slightly male (56% to 44%) and were primarily based in the US (77%, compared to 33% international). On average, respondents are 34 years old, have an income of $91k (more than double the national average of $44.5k), and work 43 hours per week at their primary job. The sample we surveyed is by no means universally representative of the average American, and the results presented here aren’t meant to be conclusive. That said, they still give us an interesting snapshot of what mid- to high-tier earners do for work on the side, how much they make from it, and how they fund it. Who is making money on the side? 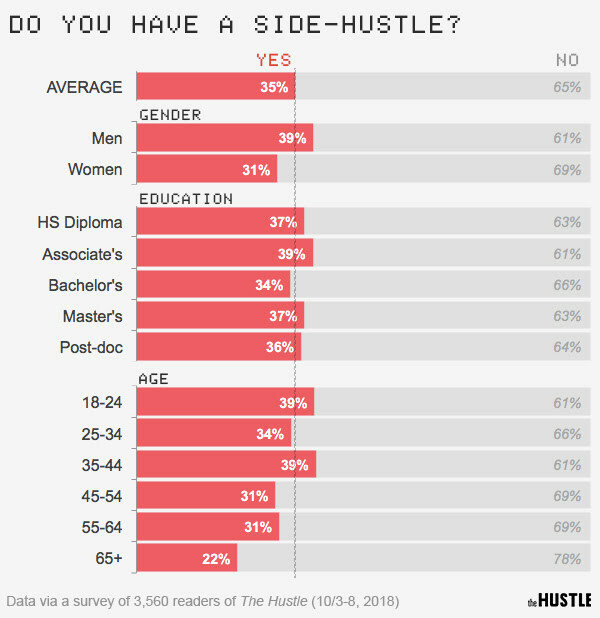 On average, we found that 35% of respondents have some kind of side-hustle. This figure varies widely based on a number of demographic factors. Men are 4% more likely than average to have a side-hustle, while women are 4% less likely to have one. Researchers have attributed this male skew in entrepreneurship to the “male hubris, female humility” effect: In general, women are less hubristic and overconfident than men, and thus less likely to start their own businesses. Interestingly, respondents with a high school diploma or associate’s degree are more, or just as, likely to have a side-hustle as those with a BA or higher — possibly because they earn less than our average respondent ($77.8k, versus $91k). But the biggest determining factor of whether or not someone has a side-hustle is the industry she or he works in. Creative professions — particularly those rooted in art and media — top the list here: 8 of 10 graphic designers report having a side-hustle, along with 7 of 10 online media professionals, and 6 of 10 photographers. These specific skill-based trades naturally lend themselves to freelance work. But they also generally pay less, which may preempt additional contract work. On the other end of the spectrum, there are jobs that just don’t seem to allow for much work on the side. Buying property has long been considered a reliable means of achieving passive income — and a booming short-term rental market seems to have had an impact on casual investors looking to get into real estate. Retail (5% of all side-hustles) also has a strong showing here, likely driven by online platforms like Amazon and Shopify. Outside of this list, people who work in certain industries are drawn to certain side-hustles: Construction workers are disproportionately likely to take on side-work with automobiles or furniture (trades that require tool expertise); marketers are more likely to start online apparel companies; PR folks tend to turn to side-hustles in writing & editing. 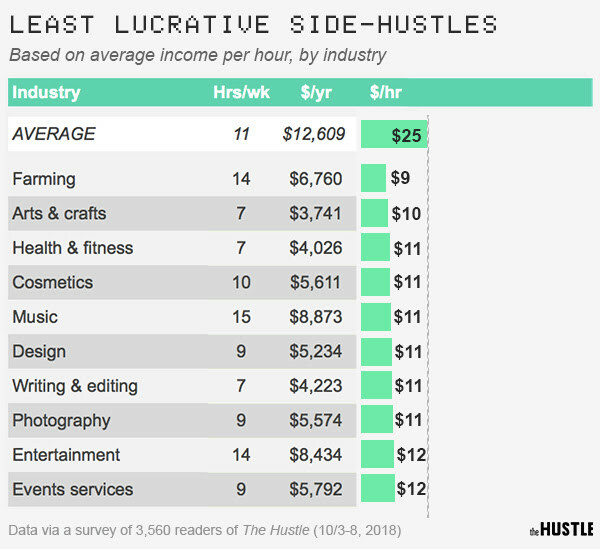 How much do people make from side-hustles? 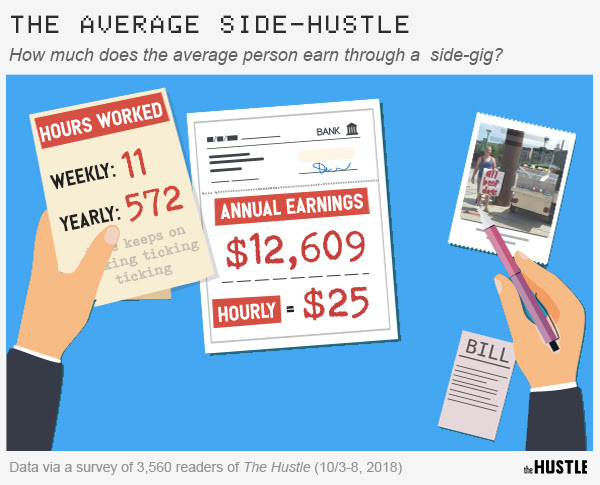 The average side-hustler spends 11 hours per week on their secondary work, and earns $12,609 per year — an average of about $25 per hour. It should come as no surprise that we don’t see a lot of lawyers moonlighting as dog walkers (there are only so many billable hours in the day, after all). Only 1 in 10 legal services workers report earning money through a secondary income stream. Here, we see a dramatically different type of list — one populated with generally high-paying, high-stress, time-consuming roles. What do people do for side-hustles? Okay, now that we know who is side-hustling, what do all these people actually do? Our survey asked respondents to categorize their side-hustle in one of 140 industries, ranging from marketing, to fine art, to farming. We sifted through these responses and compiled the most popular choices, based on the percentage of total side-hustles. 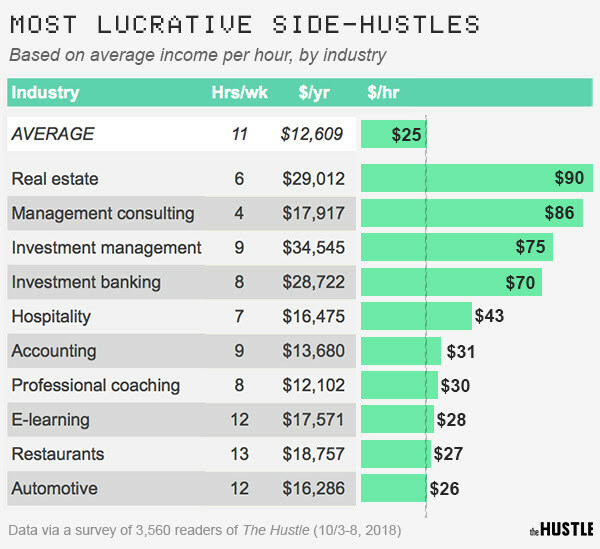 Overall, 30 industries make up ~75% of all side-hustles — but a clear, singular winner comes out on top. But not all side-hustles are created equally. Some hustlers reported impressive annual earnings ($100k+) from side-jobs, but worked 20-30 extra hours per week to get there; other hustlers made $50k on the side working 5 hours per week. Once again, real estate comes out on top: Our average respondent made $29k/year from property on just 6 hours per week, good for $90/hour. In fact, all of the top rankers here — management consulting ($86/hr), investment management ($75/hr), investment banking ($70) — reported less than 10 hours of work per week. When it comes to side-hustling, efficiency pays off. Unfortunately, not everyone chooses such lucrative, low-input work. Farming side-hustlers worked an average of 14 hours per week, and made away with just under $6.8k, or $9/hr. This isn’t surprising given that even farmers don’t make money from farming. This list seems to be populated with all of the things your high school counselor told you to never do for a living: Arts & crafts ($10/hr), music ($11/hr), writing ($11/hr) — hi, mom!— and photography ($11/hr). 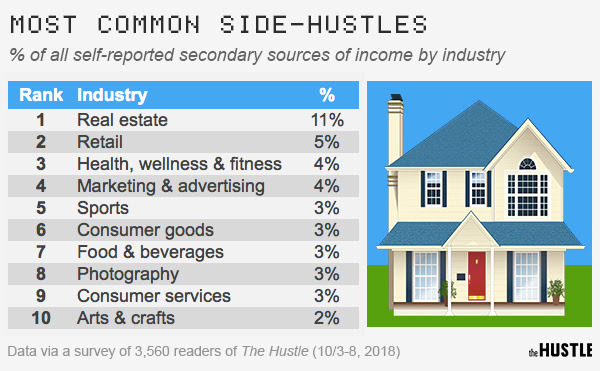 These are also the industries we saw earlier, in chart of professions most likely to have a side-hustle. How do people fund their side-hustles? Some side-hustles (see arts & crafts above) are easy to get off the ground; others, like real estate, require large amounts of capital (or, if you’re in San Francisco, your first-born child and your soul). Most respondents (58%) fund their side-hustles out-of-pocket — and a sizeable portion (38%) don’t incur any costs at all. About 19% report staking out some starter money through a traditional bank loan or family and friends. Only 1% seek out side-hustle funding from VCs (not surprising, considering that investors typically like to see full-time commitment). For the self-funded, average out-of-pocket investment runs ~$17k for the first year. Assuming you’re earning the average of $12.6k/year (and accounting for the 15.3% federal self-employment tax), you’d be able to recoup your investment in about 1.5 years’ time. Given these relatively low input costs, only 25% of side-hustlers report incurring debt. 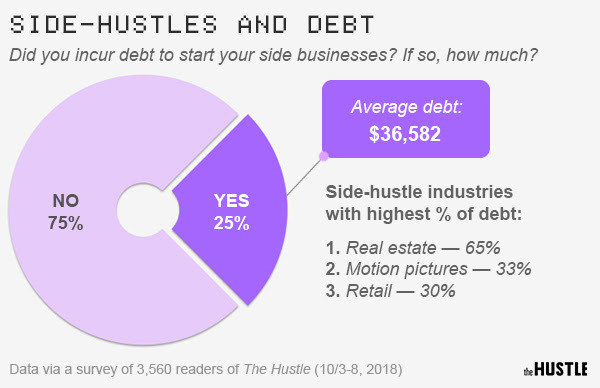 The average debt runs ~$36.5k, though this is driven up substantially by real estate hustlers, 65% of whom incur debt. 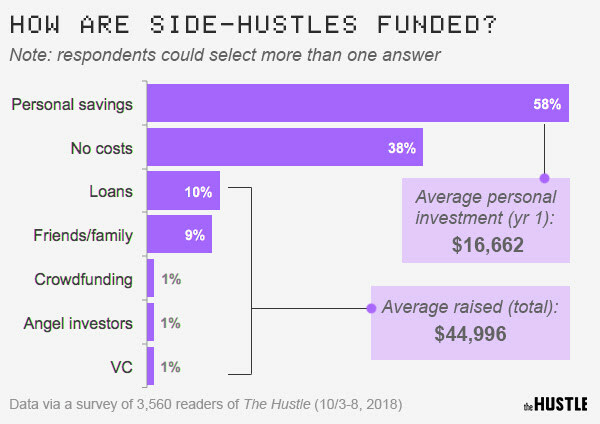 What this data shows us is that starting a side-hustle — even an ambitious one — is not as economically far-fetched as it may seem for our respondents. But again, keep in mind that our readers are not representative of the public at large: There is an inherent privilege in having the resources, time, and money to start a side-hustle: 40% of Americans struggle to afford a $400 emergency expense, no less $17k for business opportunity. For many people, a side-hustle isn’t just about money; it’s a passion or hobby that they just happen to occasionally monetize. 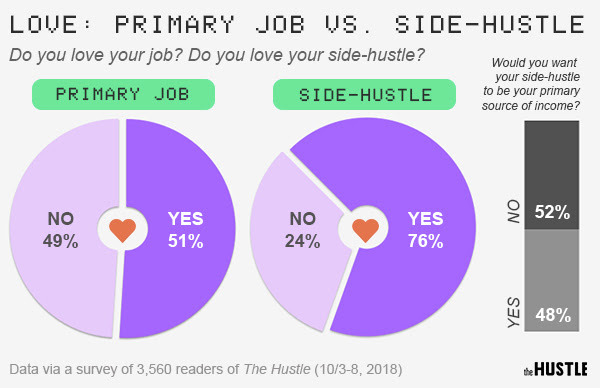 So lastly, and most importantly, we were curious to see if side-hustlers really love what they do. How does their passion for their secondary work stack up to their passion for their day job? On the whole, the field’s pretty split on their main work: 51% love it, 49% don’t. The story’s a little more clear with side-hustles: 76% definitively love what they do. People cited fears of failure and debt, the cost of getting their operation off the ground, concerns over whether or not their side-hustle was in a lucrative industry, and the dilemma of leaving a full-time, stable job for an uncertain future. Whether you’re snapping up apartments in NYC or hawking eggplants at a farmer’s market in Boise, there’s probably some merit in keeping your side-hustle a side-hustle. Oakland ZIP codes 94602, 94609, 94610, 94611, 94618, 94619, and 94705; Alameda; Albany; Berkeley; El Cerrito; Kensington; and Piedmont.